Thanks so much. This ring is awesome. My fiance and I both really like it. 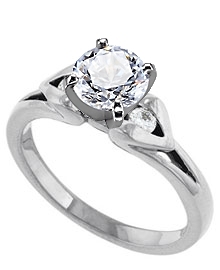 This 14k white gold fancy engagement ring has shoulders that fold back over to hold one .06 carat round diamond on each side. The diamonds have a color of G-H and clarity of SI with a .12 total carat weight. This is a Danforth matched set with a complimenting diamond band.